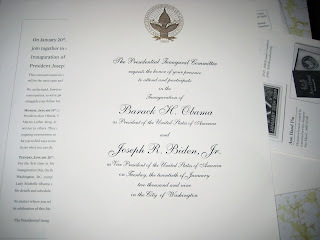 I received the invitation pictured to the left about two weeks ago, and at first thought maybe it was a real ticket to see the inauguration... I mean, it had fancy seals and engraving and was on ridiculously thick paper... so I snapped the picture to show everybody, and had thoughts of flying down to stay with my parents in Baltimore and seeing the whole thing in person. It was very exciting for like two minutes. However, closer inspection revealed there wasn't much information about the events and no real instructions... and then I noticed the invitation only invited you to events "open to the public"... so my cynical side took over and I assumed it was some sort of marketing ploy for commemorative plates or whatever and threw it in the recycling bin. Well it turns out that it was one of 1 million commemorative invitations that get sent out as part of a tradition dating back to Truman. At a million 999,999, it's not super rare or anything... but in retrospect I wish I would have held onto it as a keepsake... maybe gotten a little frame for it or something. Oh well, I'll always have this blog to remember it by.